Antique icons of the Mother of God are some of the most revered and beloved in the Christian world. Moreover, according to the legend, the very first of them were painted by St. Luke himself, including the renowned Russian icon of Our Lady of Vladimir. However, just like with religious icons of Jesus Christ, the truth is that we do not know exactly how the Virgin Mary looked like, so it is not surprising that her depictions vary. This is especially true for antique icons and the oldest images of the Mother of God. Here are several interesting examples you should know about! It is believed that the oldest known depiction of Mary with the Infant Jesus on her lap (see photo above) is a part of wall painting, found in the Catacomb of Priscilla in Rome, though this is disputed. Salus Populi Romani, meaning Protectress and Health of the Roman People, is one of the most important Byzantine antique icons of the Mother of God with Christ Child, attributed to St. Luke the Evangelist. It is currently enshrined in the Basilica di Santa Maria Maggiore in Rome. 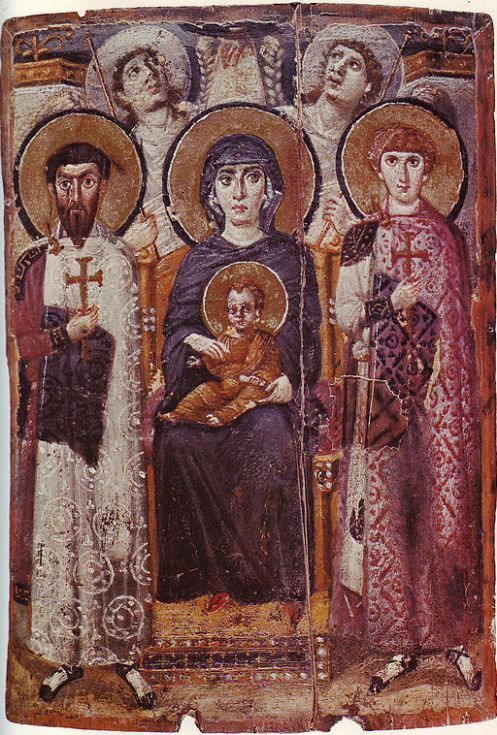 This antique icon depicting the Virgin Mary and Jesus between St. George and St. Theodore, as well as two angels gazing upward to the hand of God, is preserved at St. Catherine’s Monastery on Mount Sinai in Egypt. 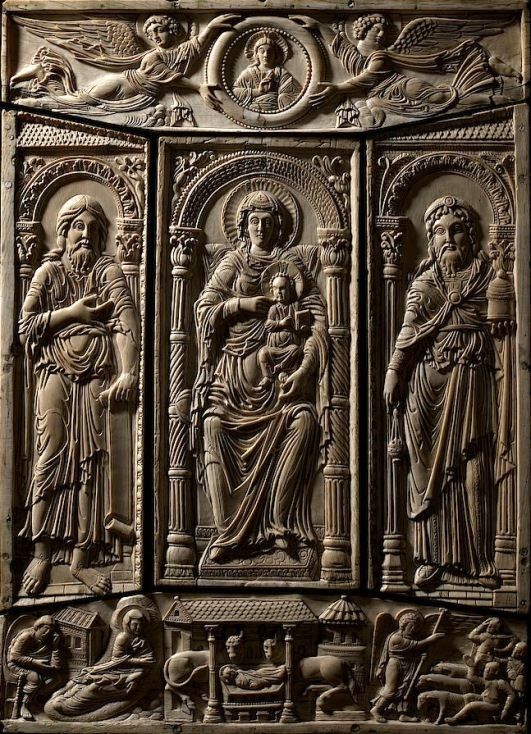 Another interesting image of the Virgin Mary and Child with angels and saints can be found on the front cover of the Lorsch Gospels written for the Lorsch Abbey (Germany) between 778 and 820. This part of the Gospels is now kept in the Victoria and Albert Museum in London. 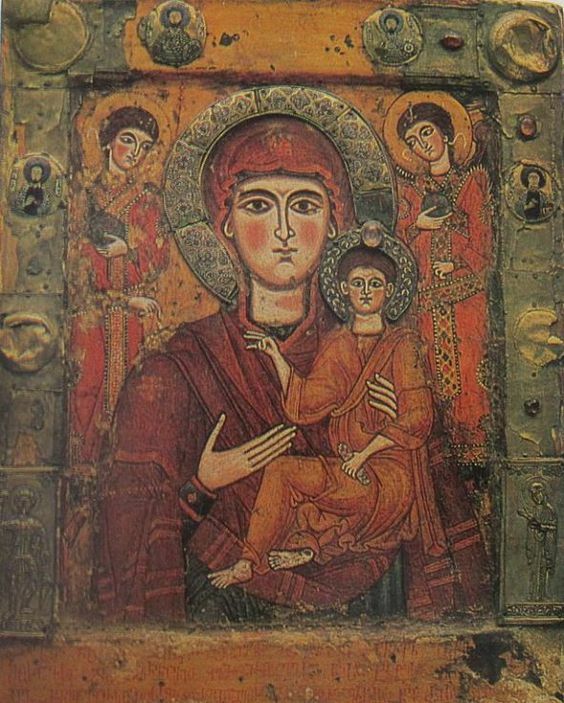 One more important example of antique icons of the Virgin Mary and Child is the Tsilkani icon of the Mother of God. It was found in the Tsilkani Temple of the Theotokos in Kartli (Georgia) and is currently kept in the Art Museum of Georgia. 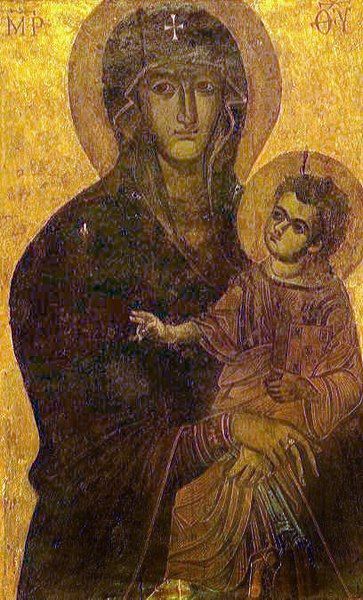 Even though this list of antique icons and images of the Mother of God is not exhaustive, it clearly shows that the depictions of the Theotokos are not all the same. Anyway, whether it comes to old Byzantine Orthodox icons, antique Russian icons, or modern religious icons, the Virgin Mary is always recognizable in any of them.